Rhesus macaques (Macaca mulatta) were able to repeat and mirror visuospatial sequences of flashing dots on a touchscreen. Within primates, the ability to understand and produce the embedded “grammatical” structures found in language, music, and mathematics is thought to be uniquely human. But is it? A new study shows that monkeys can learn to produce “supra-regular,” or “phrase-structure,” grammatical sequences that feature complexities similar to those found in human languages. Primate neurobiologists Liping Wang, Xinjian Jian, and Tenghai Long of the Chinese Academy of Sciences, in Shanghai, along with colleagues there and in France, trained two rhesus macaques, Macaca mulatta, to produce specific sequences of flashing colored dots according to specific “grammar” rules. Monkeys viewed series of two or three stimuli—flashing colored dots on a touch screen—that appeared at six spatial locations in a circular array. After a short delay (800 to 1,200 milliseconds), the monkeys were cued to either “repeat” a pattern they had seen (after viewing A B C, touch A B C) or to “mirror” it (after viewing A B C, touch C B A). Correctly learning to mirror sequences requires more sophisticated cognitive abilities than those required for simply mimicking or repeating patterns. The two macaques succeeded at following both the “repeat” and “mirror” rules over 80 percent of the time, demonstrating a more complex grammatical ability than any previously noted for nonhuman primate species. Furthermore, the monkeys trained to mirror patterns of three stimuli arranged in a circle successfully mirrored longer patterns of four or five stimuli, and to stimuli in new spatial layouts, such as a line or a triangle. 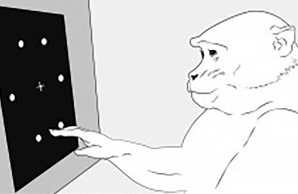 This shows that the monkeys were not merely memorizing sequences but instead spontaneously generalizing the “mirror” rule to untrained contexts.